A 10-week-old puppy will star alongside Budweiser's Clydesdale horses in a Super Bowl ad, the brewer said. The Clydesdales will be getting a new addition to their team during Super Bowl 2014. 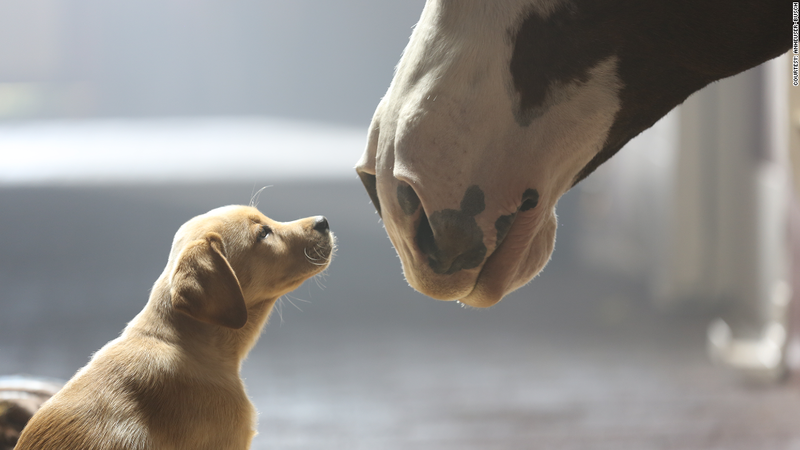 Budweiser and Bud Light brewer Anheuser-Busch bought 3-1/2 minutes of ad time for five spots, including one featuring its Clydesdale horses and, yes, a puppy. The ads may be costing the brewer $28 million or more, according to ad trackers at Kantar Media, which estimated 30 seconds of ad time sold for upwards of $4 million, on average. Of the five spots Anheuser-Busch is debuting, two feature the Clydesdales and actor Don Jeanes, continuing a storyline from one of Budweiser's widely-talked about 2013 Super Bowl spots. "Brotherhood" depicted Jeanes as the trainer of a Clydesdale foal who grew up to join the Budweiser pack. In the final, tender seconds of the ad, the horse chases after Jeanes and the two are memorably reunited. The story continues this year with the introduction of "a new, young star -- a 10-week-old puppy that forges a bond with the Clydesdales and ultimately earns a place on the team," the company said. Anheuser-Busch has been the Super Bowl's exclusive beer advertiser for at least 25 years, said spokesman Jeffrey Grass. And the Clydesdales have appeared in nearly every Super Bowl since 2002. Anheuser-Busch (BUD) is using one of the Super Bowl ads to debut its new Bud Light campaign: "The perfect beer for whatever happens." It will also launch its new Bud Light reclosable aluminum bottle, along with a new song by "well-known artist." The company promised unnamed celebrity power in two spots called "Epic Night." Anheuser-Busch declined to provide additional details, including how much it spent on the ads. A spokesman for Fox Sports, which has broadcast rights to the game, also declined to comment, citing confidentiality agreements with advertisers. Anheuser-Busch's Budweiser and Bud Light 2013 Super Bowl ads were among the most-talked about, alongside the racy fare from GoDaddy, a Jeep spot narrated by Oprah and a Dodge truck spot featuring the voice of the late radio host Paul Harvey. But that night may be best remembered for the so-called Blackout Bowl, when the lights went out in the New Orleans Superdome. Fox said the highly-coveted ad time sold out in December. It also said more people tend to watch the ads over the game, which will be played at the East Rutherford, N.J., MetLife Stadium on Feb. 2.